Houseboat Outboard Engine Options - Speed, Power, High Thrust, Makes? Houseboat with a high thrust 25 hp Mercury Big Foot outboard. I have a houseboat with an outboard engine, and am curious about high thrust models, the power, the speed, of various makes or manufacturers? I have a 25 hp Mercury Big Foot to power a 31' Houseboat. I'm thinking I may need a little more power if I find myself in a strong current and headwind at the same time. I'm going to be running around in some shallow bay water down on the coast. So, I'm wondering is anybody knows anything about the new jet thrust outboards. They say that they are quieter, more efficient, and am curious if anybody has any experience or information to share? In response to your post about looking at Jet Thrust Outboards, the only experience that I have with them is that the Police and Fire department have them installed on some of their small rescue boats. Jet thrust outboards will be discussed a little further down, but first, lets look at some of the basic, preliminary decisions and options available. As a houseboat owner, you should take a moment to analyze the houseboats intended use and purpose. Once this is identified, and a decision on whether it should be powered with a single or twin engine or outboard installation, can we make a decision on a suitable and adequate propulsion system. You first have to look at the style of houseboat that you want to power. Is the houseboat a slower displacement style hull, or is it a planing style hull? A slower displacement hull generally has a speed of +/- @ 6-8 mph and would benefit from a high thrust outboard engine. A faster planing hull generally has a higher top speed of +/- @ 20-25 mph, and would benefit from higher horsepower outboards. What is better, a single or twin engine houseboat? Each boat has to be evaluated, and both are excellent choices. 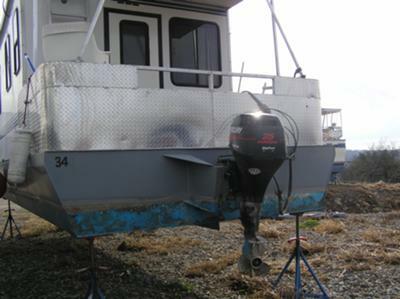 You will commonly find single outboards installed on smaller houseboats (@ 20-40 ft). Where as twin outboard installations are commonly found on bigger larger houseboats of 35 feet and up. What are the benefits or disadvantages to single or dual outboards? A single outboard will have less maintenance, yet be more trouble should it breakdown (towing). A twin outboard installation is double the maintenance, yet provides a security blanket should one breakdown. whether the fuel consumption or gas mileage of houseboats with 1 or 2 outboards is a discussion far beyond the scope of this forum post. Depending on location or area of the world, you will find makes or models of outboards such as Mercury, Johnson, Evinrude, Mariner, Yamaha, Honda, Suzuki, Nissan, Tohatsu, and many others. There are some outboard manufacturers that build 2 stroke and 4 stroke outboards for other wholesalers, distributors, or retailers everywhere. But what about Jet Thrust Outboards? My experience with jet thrust outboards has been from the local Police and Fire department use, and they have had a fairly good track record. They have small 14 ft flat bottom fishing boats for search and rescue operations. Their fishing style boats are light, flat bottomed, and are usually fiberglass, aluminum, or kevlar construction. These jet thrust engines are fairly rare in quantity or percentage, in comparison to the traditional propeller style engines found everywhere around the world. When it comes to maintenance and repairs, the choices for local or distant repair service centers appear to be much more limited, in comparison to the traditional popular lower gear case propeller shaft design. On the plus side, the are far superior when it comes to shallow water operation, and if I was to operate in these conditions, a jet outboard would rank highly on my list. Now from a comparison point of view, will a 25 hp propeller outboard provide the same thrust as a 25 hp jet outboard, now that is a good question. My opinion which is based from the police and fire department personnel, the jet outboards appear to provide less thrust than the propeller models. However I have no technical specifications to back this up. When it comes to outboards, I find them fairly simple to maintain and repair, yet I have always had an outboard repair manual on hand since they pay or themselves in the first use. Just from a troubleshooting or diagnostic point of view, they have saved me repeatedly when an outboard runs rough, stalls, or just doesn't start. In closing, the topic of outboard powered houseboats is a large one and would be require many other posts and discussions. Lastly, hopefully some of our readers will share and post comments about their houseboat outboard installations and experiences. Feel free to use the "Click here to post comments." link found near the bottom of this page. Comments for Houseboat Outboard Engine Options - Speed, Power, High Thrust, Makes? Im having a new one housebot with 20 feet x 20 feet. What the best engine for the lowest hp? Please help me if do not mind. I have a 38ft triple pontoon boat, it weighs approximately 8000 pounds. It had a 100 hp 2 stroke 1986 Mercury on it. I want to update the motor but I don't know if I should stay with a 2 stroke or a 4 stroke ? Can any one lend a little advice ? Well I have been playing with this outboard thing for a while. Im pushing a 28.5 houseboat up and down the mighty Ohio river with all sizes from a 100 hp to well now a 9.9 mercury. This engine has proven to get the best for fuel,8.5 to 9 mpg and that leaves more gold for beer! Which keeps me and others more happy! I will be rather frank with ya, there have been times we wished and could have used a little more power! I think a hull exstention will be our next step. Maybe 3 9.9's 29.7 ?? What about a triple pontoon boat? Reading the comments, I am thinking a 120 hp for a 40ft triple pontoon boat with hydraulic trim to clean it out when needed. I just bought a 40 ft fixer and has no motor on it. Advice would be appreciated. I am not lookling to go fast. Just a cruise although still like to have the power if needed on a windy day. I am a novice at owning but have rented and operated for a while. Please advise on size before I make a mistake. I just fitted a 35 ft Holiday Mansion houseboat with a 130 Honda and a 14x9 prop. The boat does 8 knot max at 4400 rpm. I prefer running at 7 knots 4000 rpm. I'm wondering if I dropped a 225 Honda if it would do much better? It is a lot of boat to push. Mdshore, if you are doing 8 knots, that is basically the hull speed that you can efficiently achieve. I just wonder if you are attaining the proper WOT for that engine? I would have thought that the Honda should be propped more in the 5000-6000 rpm range? Dual Houseboat Outboards - propellors run counterclockwise? I was wondering if you run dual outboards on a larger dual pontoon houseboat, should the propeller run one to the port and the other run to the starboard? And if so is there a right way for each? I just replaced my Yamaha 115 hp 4 stroke with a 60 hp Hi-thrust Yamaha with the special Dual thrust prop 14 x 11. I now run 16 mph same as with the 115hp and more than doubled my gas milage. Outboard jet drives loose 40 percent of the input hp. NOT GOOD for gas milage. I am redoing a 1972, 34' NAUTALINE, removing 327 Chevy and Jet drive, we have lots of weeds that clog the intake and reduces our speed until we can no longer stand the reduced speed. We must stop and get under the boat and clear the intake. In our water that is not a job for the faint at heart. One of the better attributes of a high thrust outboard, in addition to it's obvious application on a displacement boat such as yours, is it's ability to give you more thrust in reverse. Single engine boats are a handful to operate at low speeds and more bite in both directions results in more control when docking. The larger diameter the prop the better. IMHO your boat is underpowered, I would suggest a 50hp, setup so the cavitation plate is flush with the bottom of the boat. Your boat would handle a 90 but the additional amount of performance probably wouldn't justify the cost. Aqua Jet engines use more fuel per unit of thrust and your application is not a good fit. Dura-Jet in a google search will bring up more information on your question, since they handle these conversion kits. Just a note, but from the pic, it looks like the cavitation plate on the outboard leg, appears to be much lower than the keel of the boat. Which, if it is, will greatly decrease the operation of your outboard... FYI. I have fella that has a 20 x 9 ft flatbottom houseboat, with a 35 hp outboard, and he says it is a perfect match. Just my 2 cents, Mr.B.